Cycle Oregon is widely known for organizing great bike rides and supporting efforts in rural communities. 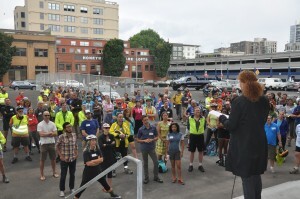 But Cycle Oregon also plays a vital role in helping Portland stay informed and connected through an event celebrating its eleventh year: the Policymaker Ride. The Policymaker Ride was started in 2004 when Cycle Oregon was working to advance Oregon’s Scenic Bikeway program. The first year we showcased the “good, bad and ugly” of the proposed Scenic Bikeway and invited elected officials, agency directors, business leaders and nonprofit executives to experience it first-hand. This invite-only affair brought out 175 local leaders to see important projects, learn about upcoming initiatives, and get to know each other through shared interest in building a more connected community. Working in partnership with Greenspaces Institute, Metro, PBOT, BPS and the Intertwine Alliance, the event this year focused on Portland’s Comprehensive Plan update, which integrates active transportation, environmental and community health and economic development. 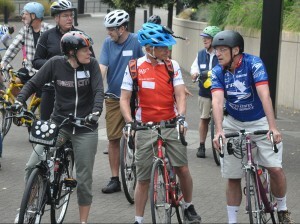 After opening remarks from Cycle Oregon Chairman Jonathan Nicholas, US Congressman Earl Blumenauer and Executive Director Alison Graves at the Moda Center, the riders saddled up and cruised the Broadway Bridge, the Park Blocks, SW Moody Boulevard, Orange Line bike routes and the Springwater Corridor. We learned about Portland’s Comprehensive Plan, innovate approaches to playgrounds at Westmoreland Park’s Nature Play area and a one-of-a-kind active transportation-only bridge across the Willamette River and more. After the event, we learned that Portland Mayor Charlie Hales has been organizing bike commute events where he will learn more about opportunities to improve Portland’s bicycle facilities. We anticipate good news about how Portland’s leaders are connecting important dots and continuing to keep Portland at the forefront.